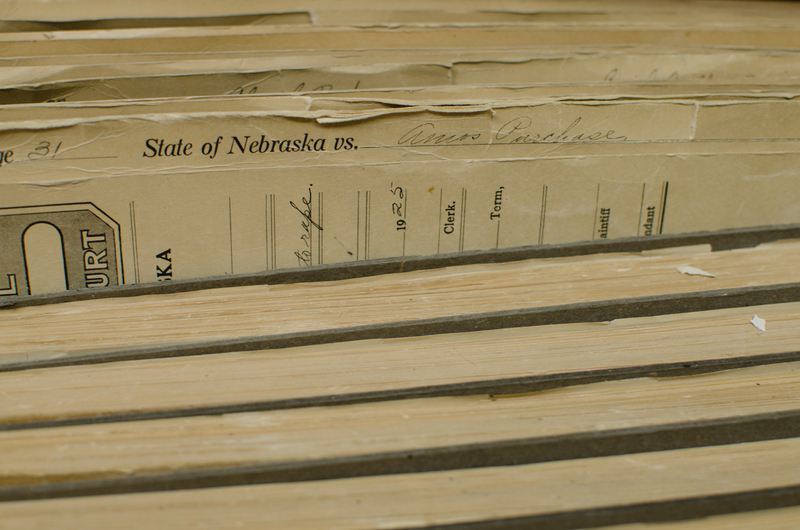 Our archives room holds records that date back to 1857, when Sarpy County was created from Douglas County. These records are a treasure trove of information for researchers and family historians. Appointments to use the archives room can be made by calling (402) 292-1880. Please note– food, beverages, and ink pens are not allowed in the archives room. Furthermore, there are some records that may only be handled by museum staff. Research requests may also be made by sending the following Genealogy Research Request Form by mail to the Sarpy County Museum at 2402 Clay Street, Bellevue, NE 68005 or by email to museum@sarpymuseum.org. Requests are typically responded to within 5 to 10 working days. 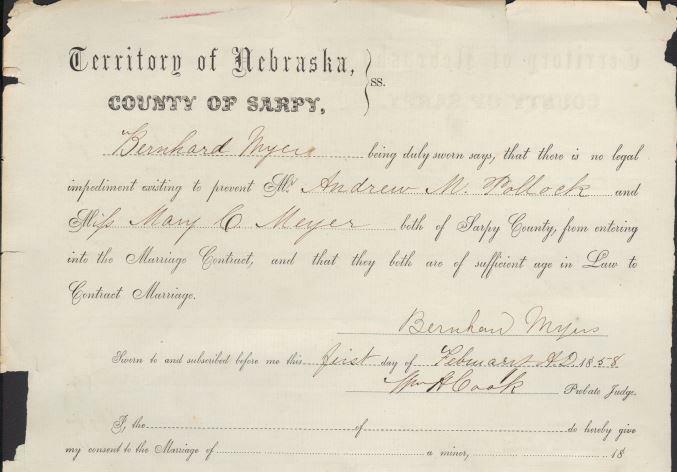 A Portion of the Marriage Record of Andrew Pollock and Mary Meyer. Unless otherwise stated, the fee for copies of records is a $1.00 for the first page and $0.50 for each additional page. Papillion Times*, October 10, 1897-April 15, 1897 & 1900- December 1988. Also available on microfilm January 6, 1898-January 11, 1912. *A significant portion of issues the Papillion Times from the 1800s was destroyed in a flood in the early 1900s. In addition to the above listed records, we have various records pertaining to local towns, cemeteries, churches, school administration records, physician records, yearbooks, and more. Our archives room also holds a wide selection of state and local history books, local maps, and family files on many of the county’s early settlers. Be sure to also check out our Events page as from time to time we have a genealogy or genealogy related programs. If you have any questions, please feel free to call us at (402) 292-1880 or email us at museum@sarpymuseum.org. My records and a photo show that the first gas or service station was called “Barnes Service”. Do your photo archives show any service station So? We don’t have photos or records of that service station. Let us know if you find something! Do you have any Naturalization papers on Henry Burgdorf /Heinrick Von Burgdorf? Or Christian “Chris” Hansen?? And do you have any info on Anchor Mill, Ist registered mill in Sarpy County? Do you find any articles on Harold Hansen 501 Lincoln Road , in the Bellevue Press archives?? Do you know the name of the white dome church on the hill adjacent to 84th street and Brentwood Drive? Before the church was built there was a trailer park there. Right now there is a lot of interest by La Vista residents since the last of that location which was Wal-Mart have met its final demise. Any pictures would be fantastic. Maybe the Omaha World Herald should cover this. The Omaha World Herald had an article this week about hermit Dynamite Pete, Levi Everett, b. Dec. 9, 1862 who lived in a cave on Pawnee Creek near So. Bend in Cass County, NE. I grew up hearing stories and have pictures of a hermit my relatives referred to as Old Henry Morris. The picture of the hermit with a beard looks like the same man in my photos. Is it the same man? Do you have information pertaining to the naming of the town, Papillion? Where would I find original blue prints of a home in Old Town Bellevue? The home was built in 1948 and has been transformed from it’s original blue prints. The new layout is strange. If you could help and point me in the right direction it would be greatly appreciated. Mike, Our photo collection is massive. I’m betting we have some but it would take a while to find them. Your best bet is to come by some time and talk to the Director. I AM TRYING TO FIND OUT WHAT HAPPENED TO THE OLD RANCH HOME WITH TWO GABLES ON KASPER STREET IN BELLEVUE NEBRASKA. I BELIEVE THE ADDRESS WAS 835 KASPER STREET OMAHA NEBR. THERE IS ANOTHER ADDRESS LISTED AS 1200 KASPER STREET BELLEVUE NEBRASKA. IT WAS RIGHT ABOVE BEARDMORE CHEVROLET IN BELLEVUE. THE HOUSE WAS A 4 BEDROOM 1 BATH. THERE WAS A STEER PICTURE IN THE MIDDLE OF THE KITCHEN FLOOR. IT WAS ABOUT 100 YEARS OLD WHEN WE LIVED THERE. WE BUILT A BARN AND WE USED TO BOARD HORSES. I LOVED THAT HOUSE. I WISH I COULD FID OUT WHAT HAPPENED TO IT. I MOVED TO CALIFORNIA AND CAME BACK TO VISIT IN 2004 AND IT WAS GONE. THERE IS STILL NOTHING ON THE LAND. PLEASE HELP MEFIND OUT WHAT HAPPENED. I’d look at the Sarpy County Assessor site. Or look at Google Earth for older pictures to see when it might have been torn down.